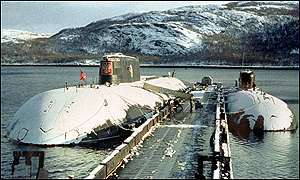 The Kursk (left) with a layer of snow on deck. The crew of the Kursk, at attention on deck. This graphic shows the various compartments on the Kursk, including escape hatches, the nuclear reactor, and the positioning of the Norwegian rescue and recovery vessel. 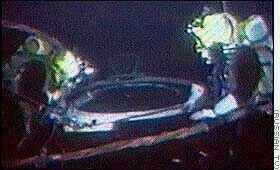 This still, from a Russian televised video, shows Norwegian divers at an escape hatch. 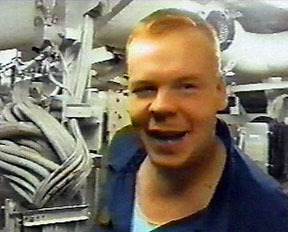 In my OBE report, I mention a Norwegian involvement. This is a still from a video showing Lieutenant-Captain Kolesnikov of the Kursk, whose written message was recovered with his body. In my OBE, I saw messages being written. My OBE report matches what he reported.